The same man (same precise details) spoke to other sources like The Telegraph, as Leith Al-Hemary/Hamwy, a local activist (see below, "star witnesses") The rebel fighter they spoke with cited five known survivors: "Mr Hemary and his cousin" were two of these, and two more must be the injured boys "who survived a massacre in Mazraat al-Qubair," shown in a video still with the article (we haven't seen that video yet). The witnesses were far enough away to live, but allegedly close enough to witness some damning festivities in Qubeir. Some of the Telegraph's witnesses (not quoted) "reported how the militiamen sang songs in praise of Mr Assad." The Daily Mail heard the added detail that "militiamen danced over dead bodies while singing pro-Assad songs." As usual, this falls into the category of things the surviving activists didn't think to video-record. One name of interest is Al-Hamwy/Hamawi/Hemary/Hamouli (transliterations differ). At least two alleged survivors/witnesses giving variants of that name, have provided incredibly helpful details to the outside media. Another yet possible relative of theirs is an opposition videographer who documented the aftermath. a Syrian farmer said ... "There was smoke rising from the buildings and a horrible smell of human flesh burning," [as he] watched Syrian troops and "shabbiha" gunmen attack his village as he hid in his family olive grove. "It was like a ghost town," he told Reuters by telephone, asking not to be named because he feared for his safety. The exact position of the government, especially on the death toll, isn't entirely clear. It seems they acknowledge only nine massacre deaths, and apparently a larger number of rebel fighters killed when the government responded. If this is so, this similarity is more with the Tremseh "massacre" than with Houla -a small rebel massacre, then armed clashes killing fighters and maybe soldiers. Concerning the latest massacre in Al-Qubeir, Al-Jaafari said that killing innocent civilians in al-Qubeir took place 5 hours before any clashes happened, adding that the images broadcast by al-Jazeera and al-Arabia are not those of the massacre victims. The Syrian TVs will air the true images of the massacre…The instigative media channels have taken to airing such fabrications before the UN Security Council meetings, added al-Jaafari. Manara also passed on Jaafari's explanation that, according to locals, "the gunmen who committed the crime came from another village called Jreijes which led the locals to call for the help of the law-enforcement members." The location of this town is not clear - perhaps the nearby Jarjarah (here on Google Maps). What Jaafari means about the videos isn't certain; at Tremseh, the bodies of dozens of slain fighters were shown as massacre victims, when really they were casualties of a lost battle. Here, it's said there are videos showing "at least a dozen" women and children dead and wrapped. Jaafari and SANA cited only nine, but apparently based on partial information of what they say is a rebel crime with rebels controlling the evidence. Mazraat Al-Qubeir seems to be a smaller village near the larger town of "Mazraf" , shown by the BBC on satellite. Mazraf is locatable on Google maps. "The nearby village of Maarizab" where the dead were buried by some accounts, could be the place we're seeing. Wikipedia's entry for Al-Qubeir, the tiny site of the massacre, cites a nearby larger town Maazraf. Note the switch in the position of the R, making a fit with Maarizab possible. Another place given on Wikimapia translates Farm Qubeir. The farm word, pasted into Google Translate, is pronounced Mazraat. 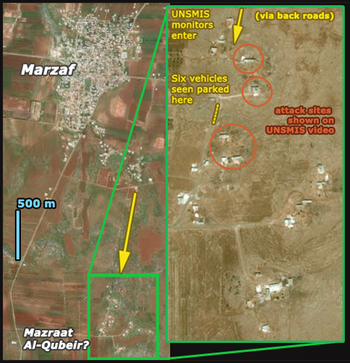 The location of Qubeir itself has remained confused until now, with the inset map, a site has been chosen matching with UN monitor video shot there on June 8 (see below). (for detailed visual explanation, see talk page) Three attack-scarred buildings are shown up-close in the video, those from the north end to village center circled in orange (visual match). This area is less than one mile south/southeast of Marzaf, and contains almost exactly 30 buildings (not all shown here). The best access would be by the main roads, but rebels took the monitors down extremely rough back roads for no clear reason. Reuters reported Qubeir "may have been targeted in revenge or as collective punishment," but noted "most said Mazraat al-Qubeir had never joined the revolt against four decades of Assad family rule." That's supposed to imply the Alawites' genocidal designs aren't against any rebellion, but against Syria's Sunnis at large. However, it might instead suggest the rebels would have a motive to attack this particular town, and so send a message to other regional fence-sitters: "the Shabiha might come for you next" (besides making the genocide point for the outsiders). This would be another parallel with the Houla massacre; those targeted were reported as primarily Sunnis who rejected the rebellion and/or had converted to Shi'ism. center building, south wall largely blown away revealing stair well, heavily shot-up as well. Other views are closer-up or even inside this building. The south face of the home just south of the monitors. Foreground: burning grain? Same home, from the northwest (whole southern circle in the map). The SE home (center-distance) was also burned. The Syrian government's initial claim of only nine massacre victims and promises to show them, as well as their full death toll and explanation of the discrepancies, will be covered here when and if that information is located. The following two videos from local activist Samer Al-Hamwy (see below) will form the basis of our visual assessment of the massacre victims. The graphic videos were both published June 6 (but dated 7/6), and seem to be filmed in daylight hours (although inside what seems to be a mosque). That would put it no later than sunset at 7:46 PM local time, and likely quite a bit before; the brightly-lit ledge suggests the sun is still fairly high and shining largely down. And this is likely after a drive (of three loaded pickups) to somewhere besides Qubeir village. For reference, the killings reportedly happened in the afternoon, under government/Shabiha control, somewhere after 2 PM, continuing to at least 5:10 PM. In fact, Mr. Al-Hamwy says "by 8 p.m., [the killers] were finished". They were finished with these victims, and the rebels had snuck off the evidence, well before that point. The total number of bodies shown between them is at least 19. Each video shows a slightly different body spread in the same red-carpeted, marble-walled space. The longer and clearer video, apparently, was shot first, with a few more bodies inserted between prior to the second video. All 19 victims, counting from right-to-left, cause of death/injuries unclear unless noted. At least three women among these dead, and at least 10 children, with three of those just little babies. That primarily men were added for the second video suggests they could be fighters killed in subsequent clashes, as opposed to massacre victims. Nonetheless, this is clearly an "at least" picture, and at 13 it's already more than the nine dead women and children SANA and Syrian officials would attribute to regional terrorists. There has been no adequate investigation, outside Syria, of this incident. As for inside, we're not supposed to know and we're not quite sure (see above: Government Narrative ). really irritating guy who claims to be from “rebel intelligence” and won’t quite accept that we have a visa from the government. In his book foreign journos are people smuggled in from Lebanon illegally and that’s that. We don’t fit his profile. He and his mates are making things difficult for our driver and translator too – their Damascus IDs and our Damascus van reg are not helping. This is new. Different. Hostile. However, an accounting has been difficult; no bodies were seen by the time UNSMIS investigators arrived; only some parts of mutilated and burnt victims and a fair amount of their blood remained. The bodies had been removed by disputed parties for different reasons. So, the Shabiha took some 20-30 of their victims' bodies, perhaps to cover up the horrific nature of the massacre before the UN's investigators arrived. Rebel videos don't seem to testify to any beheaded victims or other described signs of Islamo-nihilist cruelty, suggesting someone else carted off those victims. But the reported 57 the killers left behind, perhaps less mangled but still evidence of their crime, were also cleared out - by the rebels. Thus it was, allegedly, a collaborative effort that left the crime scenes empty by the following day. And of course as we consider intention to hide the bodies from investigators, it must be remembered that investigators were kept away from the site as well, and the signs suggest most clearly that it was unseen rebel gunmen that were shooting at investigators from the media and the UN. ↑ Siniora condemns massacre in Syria’s Al-KubeirNow Lebanon, June 8, 2012. ↑ 15.0 15.1 15.2 Set up to be shot in Syria’s no man’s land?Alex Thomson, Channel 4 News Blog, June 8, 2012. This page was last edited on 3 January 2014, at 12:26.